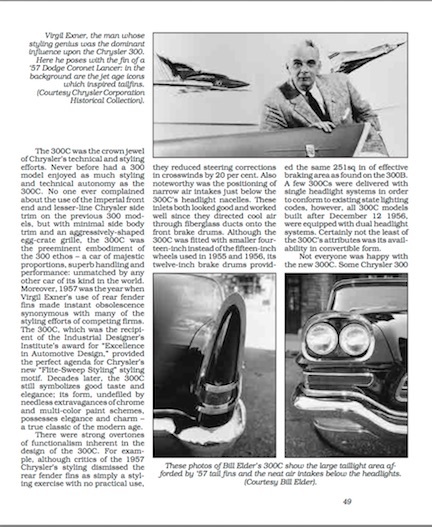 This “banker’s hot rod” really, truly was the fastest production car when it was launched in 1955. 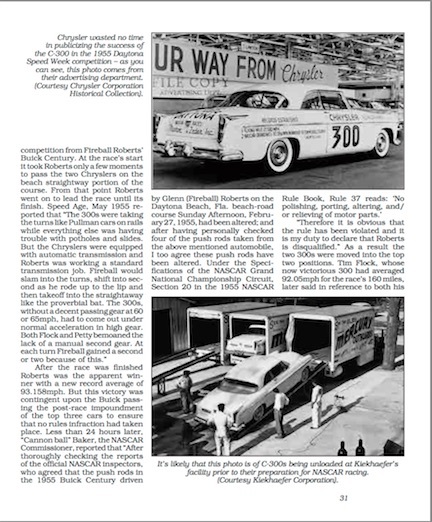 And it didn’t just convey mostly elderly gentlemen to the country club with panache but tore up racetracks with equal aplomb, winning, for instance, the 1955 NASCAR and AAA championships. Long out of print this straight reprint of a book first published in 1996 should easily find a new audience, not least since no one else has offered any new work since then (not counting several audio/visual products of 300 ads and the ubiquitous Brooklands series of road test reprints). 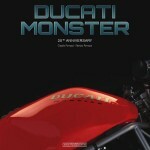 Why the book is being reissued now, 20 years later, in Veloce’s “Classic Reprint Series” is not readily apparent. 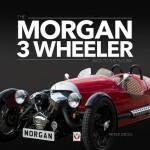 Ackerson has since written a number of automotive books, some for the same publisher so, if nothing else, his name is more bankable. The original hardcover edition is still easily found (ISBN 978-1874105657) and it does have the benefit of better photo reproduction. 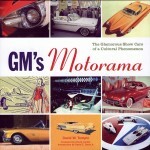 The book covers the 1955–1965 cars which we now classify as Gen 1–5. 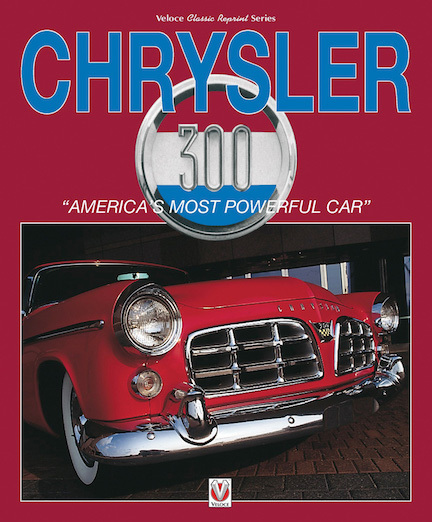 The 300 letter series was discontinued in 1966 and the model reverted to being just an ordinary Chrysler—except the name kept getting dusted of, for decidedly uninspired cars, and presently (since 2005) we’re on the Gen 10 iteration. None of this is mentioned in the book; even a straight reprint should at least have an up to date Foreword because the passage of time does yield new perspective. Ackerson, a retired public school teacher, begins with a good picture of the lay of the land. The US auto industry in the mid-1950s found itself saddled with quite dowdy-looking cars but that sported considerable performance. The solutions the first 300 offered were an answer to that, and it was uniformly praised by the press and the buying public. On that score, the book offers useful insights to anyone interested in the era. But it is really, and obviously, the 300 enthusiast who will joyfully dig through the nano detail of styling and spec changes that make up the bulk of the book. And “dig” is just the word: the prose is not exactly peppy and the type set tightly, not easy on the brain or the eyes. 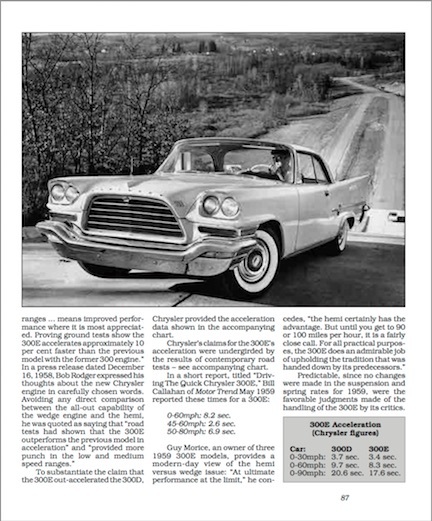 The eleven models are covered in year order, the comprehensive text being supported with various tables (specs, options, performance data and the like [in several data tables the wheelbase is given as “5.5in” which can’t be right even if you move the decimal point around or use a different unit of measure]) and lots of photos from Chrysler, the Kiekhaefer Corporation which fielded many competition cars, and private owners. A few ads and brochures round out the picture; everything is b/w except for a color section in the center of the book. That the book is thorough is undeniable, but already 20 years ago it looked 20 years old. Joy, there is an Index.